Sore to touch, and weirdly painful. I like this thought-provoking image from The Cybersmile Foundation. 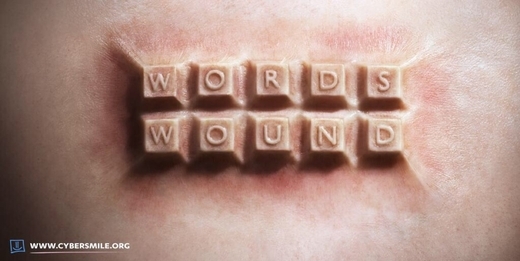 It is metaphor depicting how bullying words can ‘get under your skin’. It is the result, the site tells us, of collaboration between photographer Max Oppenheim and prosthetic artist Bill Turpin. Its power comes from how it translates emotional harm into physical damage. Because of this, not only does this image depict the consequences of bullying, it makes me think of self harm too. The UK’s Mental Health Foundation estimates between ‘1 in 12 and 1 in 15 young people self harm in the UK‘. While online self-harm, self-trolling, has already contributed to suicides that have hit the news. For me, this image derives much of its power from the cloud of anxiety around the hidden hell of bullying and self harm that teenagers endure. Constructing this image involved making a cast of a young woman’s back. Randomly, this happened to be my stepdaughter, actress Beth Symons. I am told this is all in a day’s work for an actress. This entry was posted in Marketing, Metaphor and tagged Beth Symons, Bill Turpin, cyber bullying, Cyberbullying, cybersmile.org, Max Oppenheim, Mental Health Foundation, Self harming, words wound. Bookmark the permalink.